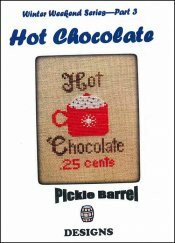 Winter Weekend 3: Hot Chocolate [W6585] - $6.00 : Yarn Tree, Your wholesale source for cross stitch supplies. Cross stitch pattern by Pickle Barrel Designs. Have you been outside on a cold winter day & want something warm to drink? Hot chocolate it is! Enjoy a cup for only $0.25! Stitch count is 46 x 67.